This is the recipe for my Mom's potato salad. 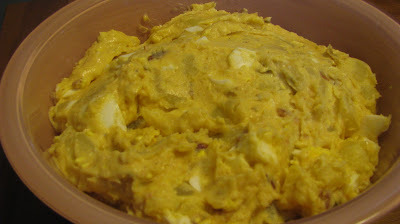 It is a combination of the German potato salad she grew up eating and the mayo based potato salad that my Dad preferred. Boiling eggs that peel easy is tricky. Click on the link in the ingredients list for MY tricks. Do not use russet potatoes for a potato salad. You need the texture of red potatoes.